The "steaks" themselves were tasty (heavily altered with additional seasonings). My steaks held their shape quite well. I cooked 1/2 batch on the stove and another batch in the oven... preferred the taste of the stove cooked batch, but the oven cooked batch tasted good too. The great disappointment with this recipe was the sauce - it was horrible, to put it kindly! I followed the advice of others to drastically cut the ketchup - but it didn't do much for the flavor. It was far from authentic tasting. I had extra patties and no sauce (not that I would have used the sauce anyway) - the next day I decided to try using Liptons Mushroom and Onion soup mix for the gravy. I followed the package instructions for making gravy... DELICIOUS! 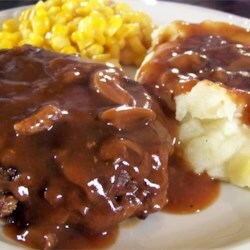 It was hands down the best tasting sauce for salisbury steak and so simple to make. So, if you're craving an old cafeteria food favorite - don't waste your time with the recipe for the sauce - buy a box of Lipton Mushroom Onion soup mix and make the gravy with it - you won't regret it!